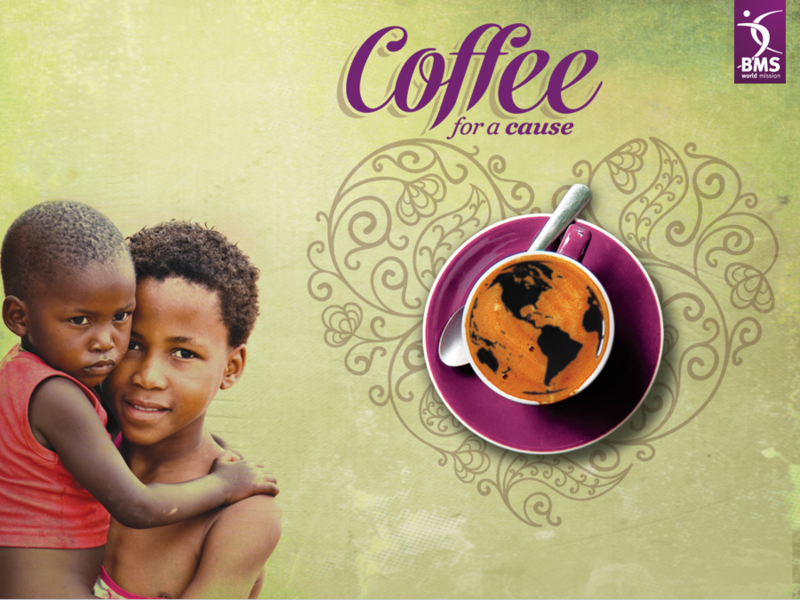 Coffee for a cause is a coffee morning resource supporting BMS World Mission’s preschool education projects around the world. The model is simple: working with the local church, children living in poor communities in Africa and Latin America who would otherwise be disadvantaged when they first went to primary school are given a head start. These children come from very poor homes, their parents may be illiterate and food may be scarce. 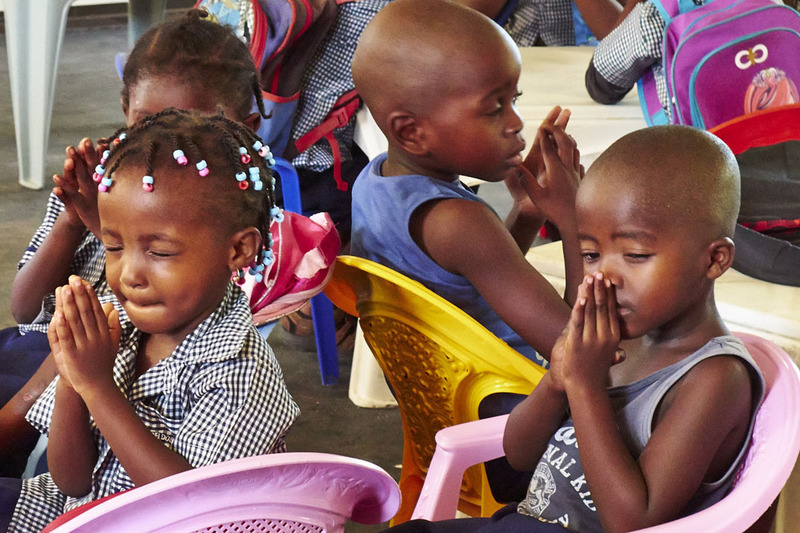 Children attending a preschool project get everything you’d expect from a preschool, plus a healthy meal, lessons in basic hygiene such as washing your hands and cleaning your teeth, and the opportunity to hear the gospel and Bible stories. Without this support, these children would start primary school at a disadvantage, and that disadvantage would slow them down throughout their school careers, leading many to quit education altogether. In some countries, unless a child can write their own name they will not be accepted into primary school. Thanks to these projects, many of these children are now staying in education, ensuring brighter prospects for their futures as they take their first steps towards breaking out of the poverty cycle. You could hold your coffee morning mid-week, after a Sunday morning service or as part of a church coffee shop outreach. One day of schooling for a child costs around £1 – the price we suggest for a cup of coffee or slice of cake. Every cup of coffee and slice of cake you sell will help build a better future for these children. Thank you for supporting Coffee for a cause. These gifts will make a real difference to the lives of vulnerable children. 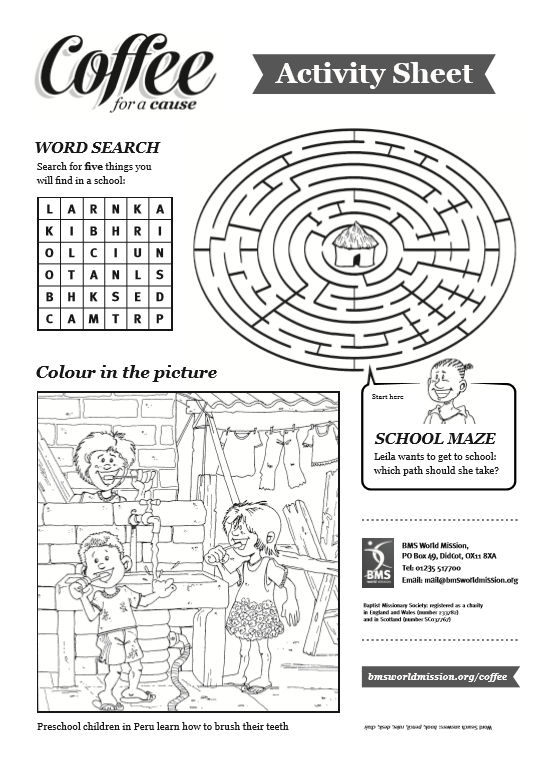 The activity sheet contains a picture for colouring in, a word search and maze, all related to the theme of school and BMS preschool work. Download the sheet and photocopy for children attending your event. 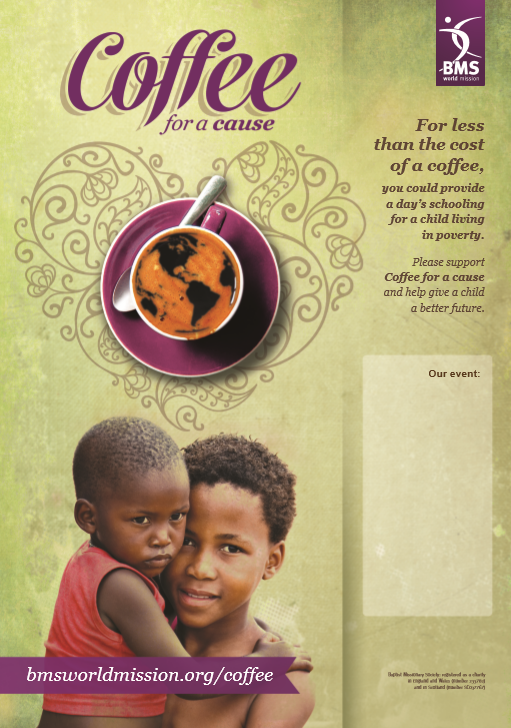 Use this interactive poster to help turn a coffee event into an opportunity to support BMS World Mission’s life-transforming work through Coffee for a cause. 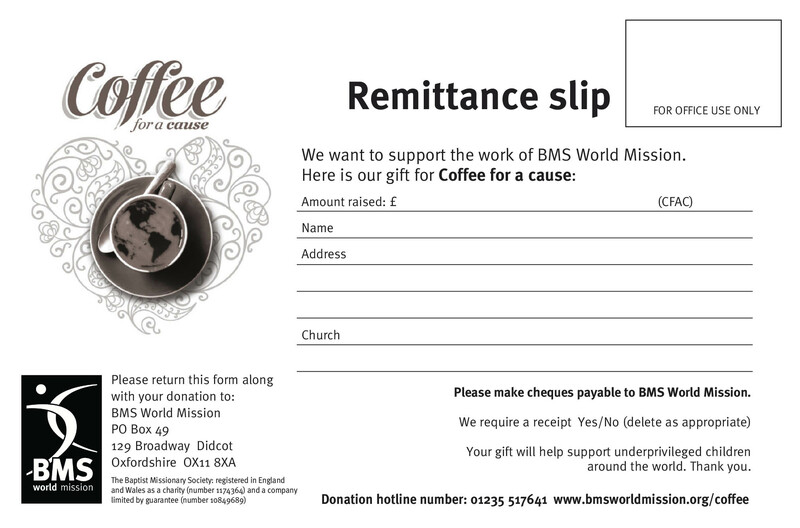 Please download and complete the remittance slip when a gift in response to Coffee for a cause. Visit our shop to order more great resources.